White crystals or crystalline powder, odorless, sweetness. It really solves in water, doesn’t solve in ethanol or ethyl ether. Glycine also known as aminoacetic acid, it used to compound pyrethroid pesticide intermediates and glycine ethyl ester hydrochloride in the field of pesticide production, and also used to compound fungicide urea and solid glyphosate herbicide, in addition, it also used in chemical fertilizer, medicine, food additive and spice etc industries. 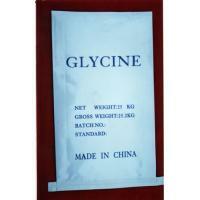 Glycine is a non-essential amino acid for human development. Glycine is an inhibitory neurotransmitter in spinal cord, allosteric regulator of NMDA receptors. Conclusion: This product conforms to requirements of FCCIV grade standard. Conclusion: This product conforms to requirements of USP grade standard. In 25kgs fiber drum double polyethylene bags inside or in 25kgs kraft paper bags preserve in well-closed containers, at controlled room temperature. To get more information, just feel free to contact with us. Thanks.